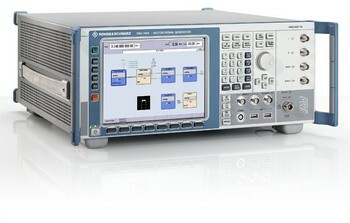 The Rohde & Schwarz SMJ100A is a multi-purpose signal generator that is designed for today’s laboratories, offering the flexibility and signal quality required in challenging research and design applications. Its low setting times and flexible baseband make this vector signal generator an ideal solution for use in production applications. The baseband provides operators with real time signals and replays of pre-calculated waveforms, and the model also features a high resolution display that enables users to read measurements clearly in different light settings. The SMJ100A vector signal generator supports both the 6 GHz and 3 GHz frequency options. Its internal baseband generator handles a wide selection of digital standards including GSM/EDGE, CDMA2000, and 3GPP FDD. In addition, this multi-purpose signal generator is designed to offer a excellent range of broad bandwidth. This characteristic makes it an ideal choice for applications involving new and emerging standards. The in-built arbitrary waveform generator enhances the versatility of SMJ100A and is capable of offering 64 Msamples sequences, and is excellent for use with diverse signals such as Matlab and R&S WinIQSIM. Learn more about 3GPP here. With its high signal quality, the SMJ100A vector signal generator stands out and customers report solid performance and minimal downtimes. It adeptly offers high level repeatability, high-stability reference oscillator, excellent ACLR performance, –153 dBc wideband noise, and a –133 dBc SSB phase noise. In addition, its internal baseband versatility makes the signal generator a suitable choice for a wide range of applications, and its internal 30 GB hard disk provides users with a large space for storing modulation data and waveforms. Other technology of note that enhances the versatility and functionality of this model include the arbitrary waveform generator and internal baseband generator. One of the features that make the SMJ100A vector signal generator an intuitive test solution is its full color display. This display delivers a resolution of 800 × 600 pixels and the models smart features use a context-sensitive help system and tool tips for edit fields. The SMJ100A can be controlled remotely through GPIB and LAN, and conveniently takes advantage of USB connectors for memory stick, keyboard, and mouse, and gives operators the option to select their preferred trigger signals. An easy-to-follow block signal flow is easily achievable for technicians with the SMJ100A signal generator All the functional units are represented by a block to provide the user with an effective and quick overview. In addition, this quality multi-purpose generator makes use of a rotary knob that allows the user to navigate through the block diagram easily. This feature also simplifies selection of parameters and navigation in various menus. Contact us about the R&S SMJ100A today. This entry was posted in Site News and tagged Rohde & Schwarz SMJ100A. Bookmark the permalink.